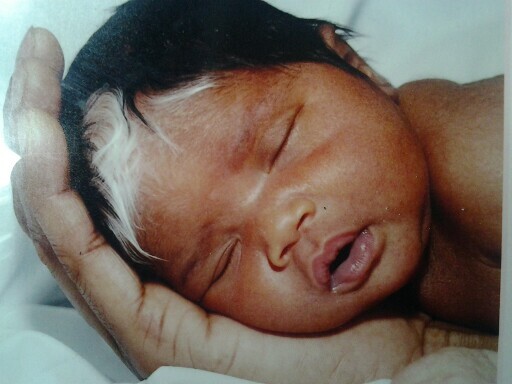 This neonate has a white forelock of hairs and patch of hypopigmentation on forehead. There are no other anomalies seen. of hairs was present then it is suggestive of Partial Albinism also known as Piebaldism. It is characterized by well-demarcated amelanotic patches usually seen on forehead, anterior scalp, ventral trunk, elbows and knees. Its mode of inheritance is autosomal dominant. It occurs because of defective melanocyte proliferation or migration from the neural crest during development. There is permanent absence of melanocytes and melanosomes in amelanotic patches. Alternatively, there is decreased number of abnormally large melanocytes in these areas. Vitiligo is usually not congenital and is progressive in nature while piebaldism is congenital and static. Waardenburg syndrome is associated with displacement of canthi and puncta, heterochromia of iris and deafness besides patch of hypopigmentation and white forelock of hairs.